About 6 years ago I decided I wasn’t watching Netflix enough to warrant keeping my subscription so I decided to put it on hold. For awhile. When I moved in with my husband (that sounds weird… before we were married), we decided to get a subscription again so I just reinstated mine. Apparently they kept my queue. For three years. I never really bothered checking on it, just kept adding things, or adding things to the top, so that occasionally when I’m not paying attention, strange things I no longer care about show up in the mail. Like random British documentaries. I still watch them though. One thing I did notice throughout some of my watching. Have you ever looked in a British person’s liquor cabinet? Everyone has a bottle of Pimm’s. I watched a documentary on Windsor Castle a couple weeks ago and you know what? Bottles of Pimm’s everywhere!! The Pimm’s Cup cocktail was unheard of to me until a couple years ago, and I only learned of its existence because it was on a menu of drinks I could have when I got my nails done at this British salon I frequented. So I picked up a bottle of Pimm’s with the intention of trying out the cocktail and then it sat next to that bottle of Aquavit being sad friends together on the liquor shelf. Until today. There are SO many versions of the Pimm’s Cup. All of them calling themselves ‘classic’. The recipe on the bottle is to just pour it into a glass with lemon-lime soda and add a lemon wheel. That was a bit too basic for me. So I muddled together a couple of ideas and came up with the recipe below (borrowing the use of cucumbers from Bon Appetit online). One thing a lot of the recipes alluded to was that this was a ‘summer drink’, and was very ‘refreshing’. But isn’t summer in England like, 60 degrees? That’s close enough to my ‘winter’ here in L.A. And I enjoy a refreshing drink regardless of the weather. I always start with my garnishes first. 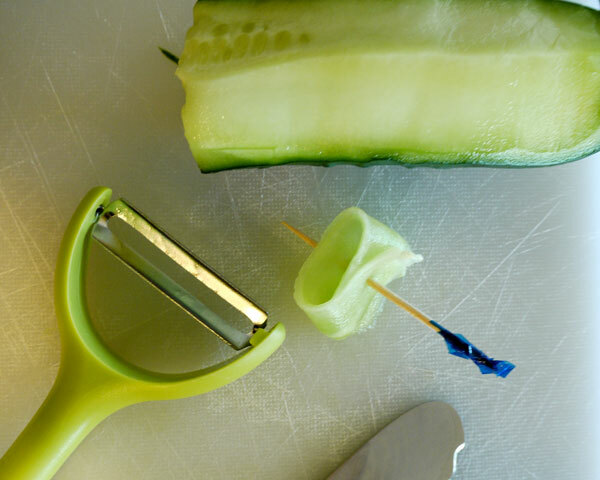 So, peel off the dark green skin of a cucumber and, using a vegetable peeler, thinly slice off longways a piece of cucumber. Thread that in an O- or S-shape through a toothpick. Work the toothpick around a little to open the hole and remove the toothpick and thread the peel onto a clean sprig of rosemary. Next, in the glass half of a Boston shaker, muddle together the cucumber rounds and the mint. Pour in the Pimm’s and the lemon juice and fill the glass 2/3 with ice. Shake and strain into a Collins glass filled with ice. Top off with ginger beer (around 2 to 3 oz). Add garnish. Repeat some lines from Mary Poppins.